My life was blessed when a dear friend asked me if I would adopt Ice. His original adopters were moving to Florida and no longer wanted a dog. 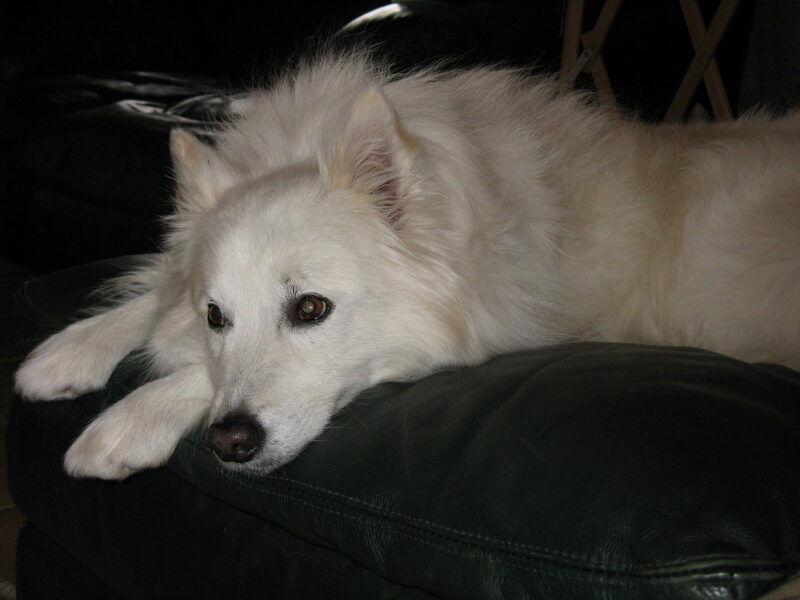 From speaking with the breeder, I learned that Ice had been fed, walked and groomed, but never allowed in the home, spending all of his time, alone, in the back yard. I had recently lost a female greyhound due to kidney disease, and my male greyhound, Happy Endings, was lonely without a dog pal. I agreed to meet Ice. When the breeder walked Ice into the room, momentarily, I stopped breathing. This beautiful white dog with a gentle spirit came right up to me, and placed his two front paws on my knees. We fell in love, instantly. He was my fur kid, he knew it, I knew it, and he came home with me that day. A year or so later, I adopted Daisie Mae, a Golden/Chow pooch that had been rescued from an abusive home. Ice and Daisie Mate clicked immediately, and became inseparable. They were similar in size and weight, and watching them romp throughout the house, charging in and out of the doggie door, with Haps following on behind, warmed my heart. Ice was now sleeping on my bed, had companionship when I was working, and would serve as my protector when he accompanied me to work on the weekends. When Ice was ten, I started fostering greyhounds. At 30 lbs., Ice was always a gracious host, but made it clear that, despite his size, he was the alpha in the home. None of the greyhounds I fostered every challenged his position. Starting in the spring of 2012, Ice began to have seizures. They became progressively more aggressive. To watch my buddy claw at the air, his entire body helpless and shuddering because his neurological system was out of whack, was unbearable. I would hold him, stroke him, and talk to him, during these seizures, and I believe he heard me. When I touched him, his first reaction was to nip, but somewhere in his brain, he knew it was me, backed off and let me hold him. I went through seizures with my first greyhound, Molly. One evening, when I saw her bounce off my couch onto the floor, I knew it was time for her to cross over, just like it was time for Ice to move on and become reacquainted with Daisie Mae. In my opinion, true love is letting our pets go when it’s their time, not our time. Once my darling’s quality of life has deteriorated to mere existence, it’s time to let our best friends move on, regardless of how painful it is for us. I miss my little guy so much, but I’m thankful that he and I connected and enjoyed thirteen wonderful years. Id say Ice had a good long life, with everything he could have wanted.